Stop. Do not panic. Remain calm. Quickly assess the situation and try to determine which type of an encounter this might be – sighting, surprise or close encounter. When bears are caught off guard, they are stressed, and usually just want to flee. Generally, the noisier the bear is, the less dangerous it is, provided you don't approach the bear. The noise is meant to ‘scare’ you off and acts as a warning signal. Thanks for Cheryl and Al for the video! Vote and Vote Often !! October 22nd is Election Day in all Ontario municipalities. Did you know that in municipal elections non-residents can also vote? You can vote in any municipality where you own land or are a tenant. (you can only vote once per municipality) You can only have one residence but you can be a tenant in many ways such as a commercial property or a campsite. 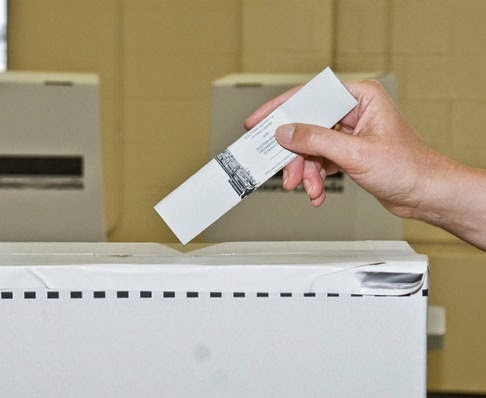 All Bare Oaks members with a long-term campsite are non-residential tenants under Ontario Municipal Elections Act and are therefore eligible to vote in East Gwillimbury. Several members are already registered and have received their voter card. Note: East Gwillimbury has now switched to a ward system with two councillors per ward. Bare Oaks is located in Ward 3. Because your vote can make a difference. There are 139 potential voters at Bare Oaks. When you look at the 2014 results for East Gwillimbury, you can see that 185 votes could have changed who won. Fill it out and take it with ID and LOO to the Civic Centre (Leslie St. & Mount Albert Rd.) on weekdays between 8:30am and 4:30pm. If you do this by October 19, you will be added to the voter's list. Or you can simply take the form (with ID and LOO) to an advanced poll or to the polling station on election day (Oct.22) and present it there. You can attend a Ward 3 all-candidates meeting on Wednesday October 10th organized by the Mount Albert Village Association at 7:00pm in the Mount Albert Community Centre, 53 Main Street.